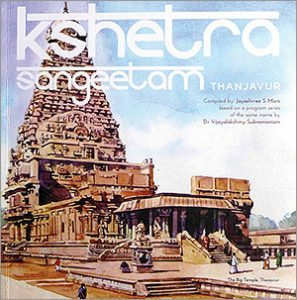 Kshetra Sangeetam Thanjavur is a journey born purely out of passion. For the singer, Dr. Vijayalakshmy Subramaniam, this book is an expression of her faith in God, her devotion to the composers, the temples and ultimately, Carnatic Music. Jayashrree S. Mani, the publisher, embarked on this journey to share her fascination for faith and its impact on culture by recording the artiste’s and the scholars’ work in a manner that will prove to be delightful to both amateurs and connoisseurs alike. 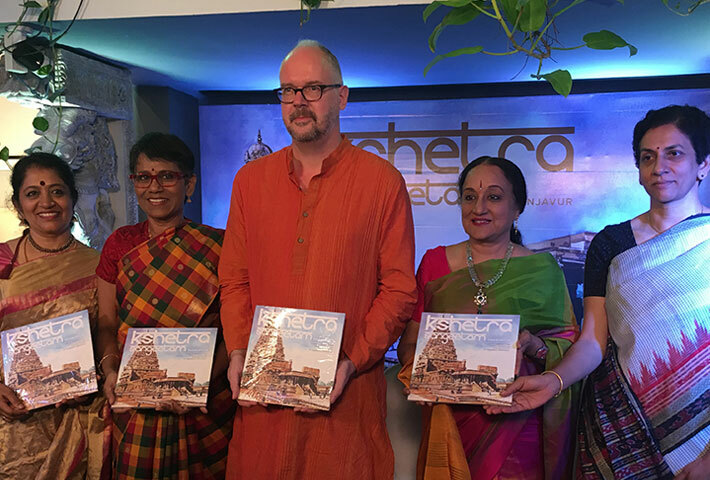 This is a unique book and music album which attempts to capture the ethos of Thanjavur, through its music and history along with eminent scholars. Join us on this odyssey that promises to be culturally and historically illuminating and visually compelling, a music lover’s delight. As Vijayalakshmy Subramaniam, the artiste, takes her audience on a spiritual journey, they experience the divinity of the Kshetra through the beauty and magnificence of the musical compositions and hymns, the outpourings of composers, saints and philosophers; and the knowledge of scholars. The book manages to capture not just the core subject Kshetram and the Sangeetam that revolves around it, the mystique of the architecture the aspects that enthrall a person on ground is beautifully captured to keep it engaging to all, young and old alike. Unlike other publications in this genre, the hope of the publisher is to share the awareness of the role of faith in the past.A gentle faith expressed in music and the arts, which was woven into the fabric of day to day life, and yet inspired a king and people with steely resolve in the making of a vast international empire.